G3 Ferrari G10006 Delizia Pizza Oven is one of the best-selling pizza ovens in the UK and if you love making pizzas at home and are looking for an indoor countertop top pizza oven that is portable and takes really less space then you have to read this review. This pizza oven makes really amazing thin crust pizzas which is crisp at the bottom with gooey cheese and well-cooked toppings on the top. If you are looking for a portable and easy to use pizza oven then this might be the one you are looking for, in order to know more about the pros and cons of the pizza oven keep reading the post. 1. The Pizza Oven is extremely easy to use and once you get it home, all you have to do is plug it in and read the manual before you get started with the cooking. There is no need to do any step prior to using this pizza oven which is probably one of the best things about this pizza oven. 2. The pizza oven is portable and really light in weight. You can easily place this oven on your countertop and if you have a small kitchen then you can even store it in your cabinets. 3. You can easily cook pizza in under 5 minutes which is pretty amazing for a small electric oven like this and depending on the thickness of your base you can decide on the temperature settings. Usually the pizza oven is good at cooking thin-medium crust pizzas and honestly, we really loved the way it looked the thin crust pizzas. 4. Now, coming to the taste of the pizzas that was cooked inside the oven, overall, it tasted really good. The base came out nice and crisp while the toppings were cooked perfectly and the cheese was melted right. The pizza that we cooked inside the oven was perfect and the quality of pizzas was really good and it felt like the ones you get in a restaurant. Honestly, we were shocked at the taste of the pizzas because they tasted so so good! 5. The oven is able to reach a really high temperature which is rare with many electric pizza ovens. 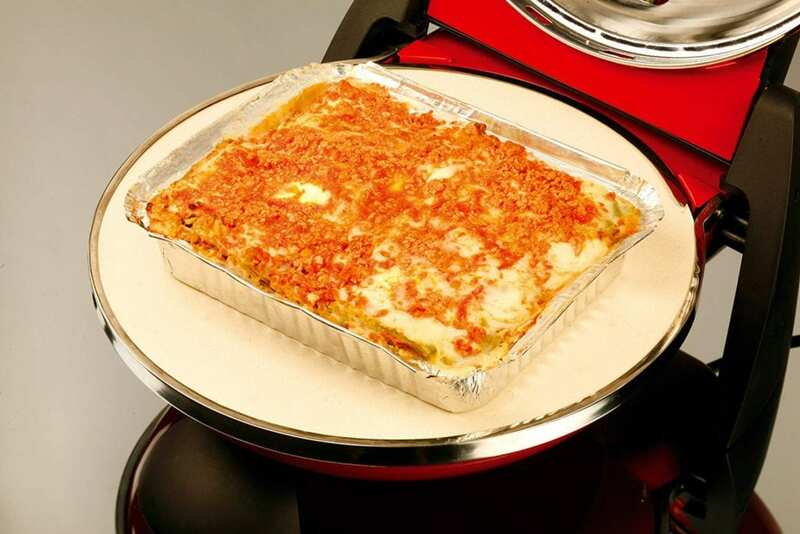 For its size, the oven performs really well and it can reach up to 390°C which is really really hot and the refractory plate cooks the base evenly. The oven can make a maximum 11-inch pizza, however, we would suggest going for a 10-inch pizza as that cooks really well and evenly giving you more space for movement inside the oven. The oven is really easy to use and you have the temperature knob which you can use to adjust the heat you want to maintain inside the oven. It is preferable to cook at 2.5 as that ensures a high temperature but at the same time does not burn the pizza base. Would I recommend this pizza oven?- Yes. 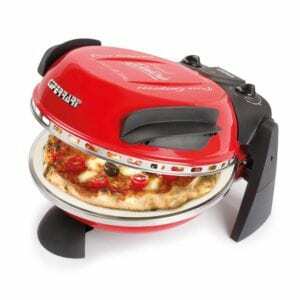 It is probably the best pizza oven in the given price range and you can cook pizzas super fast inside the oven. The oven reaches really high temperatures that are ideal for cooking pizzas and cleaning up the oven after cooking is extremely easy as well. It comes with a wooden paddle with the help of it, you can place the pizza, right in the center of the oven. The pizza oven is even portable which makes it really easy to store and transport as well. This was by far one of the most amazing pizza ovens and if you are from the US then you should check out the Forno Magnifico Pizza oven review as these two ovens are very similar in their designs.